The federal election is less than two months away and campaigning is gradually entering the critical phase. Are the election campaigns of the German parties up to scratch? What is the best way to reach voters in 2017? And what can parties learn from marketing measures implemented by successful companies? Svenja Teichmann, CEO of the digital consulting agency crowdmedia and political marketing expert, offers insights in an interview with The Restless CMO. Ms Teichmann, you successfully organized digital political marketing in Hamburg for the FDP. Do you think that the FDP is currently the only party that truly comprehends political marketing in Germany? From the outside looking in – crowdmedia is currently not working for the FDP, but for the Young Liberals (the young wing of the FDP) – it seems the FDP is certainly trying out lots of different approaches. The party’s agenda is all about digitalization so they are trying out a number of different channels to bring this message home to the public. Only a couple of weeks ago, for example, Christian Lindner launched a video campaign with Amazon’s Alexa where he asked the interactive personal assistant to explain the meaning of complex government-related German words. The other parties have meanwhile embraced this trend too. The FDP is no longer the only party in this space, but in my opinion, they are far ahead of all the others. I am impressed with all the approaches the FDP is taking. We see good lighthouse campaigns being launched every now and again. All parties appear to be taking a campaign-driven approach, especially in the federal and state elections, launching isolated actions now and then. However, I don’t see any of the parties developing a comprehensive or sustainable online approach. The parties are not making any long-term plans to maintain the interest these campaigns generate. Are the 2017 digital marketing strategies of the German parties up to scratch in your opinion? The parties are still obviously taking baby steps with their online efforts. Of particular mention here is the strong focus on social media. Now don’t get me wrong, I think that social media is a great dialogue tool – but unfortunately, more often than not, the second step is taken before the first: Take, for example, a great website that fulfils all SEO criteria and has visibility. What is frequently missing is a comprehensive concept that tries to discover what interests people, how voters choose a party and how to reach other new individuals organically or through sponsored content. When voters have been steered towards a theme that interests them, you still have to ask: How can they and their interest be maintained? An effective method could be, for example, implementing a call-to-action, to animate users to write an e-mail or watch a video in order to be able to collect further useful information. This even happens occasionally. And the budgets are also being shifted in this direction in the meantime, also taking Facebook and Google into account. Nevertheless, I have a feeling that the focus of many parties is still stronger on posters and street campaigning. 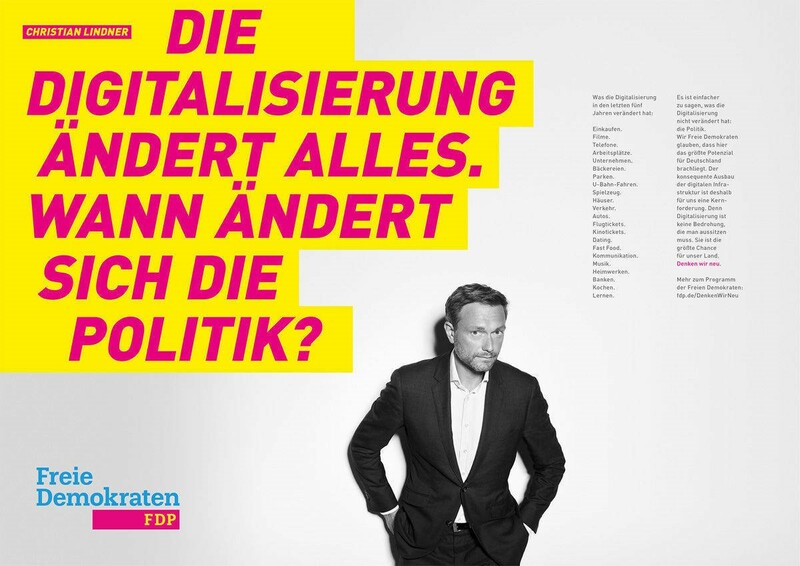 The FDP is currently placing the spotlight quite intensively on Christian Lindner during the election campaign. Bearing in mind successful international campaigns like Macron and Trump, is that a clever strategy? Seen from a digital perspective, I must say that it makes a lot of sense. Convincing online presentations work best with clear emotional impact and authenticity. This requires the human factor, a person – and when you have the right person, one who can really motivate – content is communicated significantly better. Schulz is a great example of this, Christian Lindner does this very skillfully and has a highly personalized communication style and of course the CDU concentrates mainly on Angela Merkel. People like it when content is associated with a person and Lindner and Co. simply make that content more tangible. If we extract this from the political context and apply it to the B2B and B2C segments: people choose people. Can a party’s election campaign strategy be successful without this cult of personality? Are there any other promising strategies for success in 2017? Yes, campaigning on policies is also possible. That doesn’t just mean that the policies a party puts forward should be clearly communicated, although of course this is very important – for example the Pirate Party put forward a manifesto based on IT and digital policies and the Green Party campaigned for environmental consciousness and sustainability – but that these policies are consistently fed into communications in a new and credible way. So yes, I am convinced that it is possible to launch a successful election campaign without this cult of personality. What is even more important is a strategic digital concept that makes it clear which policies are being put forward, and which target groups should be receiving which messages via which channel. One thing I think the political parties are guilty of is severe self-centeredness: it seems that everyone thinks it’s ok to just communicate their own political message. And it is usually done in their own political language, which very often members of the public who don’t hear things like this on a daily basis find hard to understand. What’s missing is a dialogue and looking at things through the eyes of the target group. So it is not only a matter of communicating messages, but also about asking: what kind of solutions does our party offer to address the concerns of the public? What are the best digital marketing methods for parties to reach voters? Should parties rely on Snapchat, Instagram etc? In general, it is not mandatory for everyone to do everything. Of much greater importance is to do one channel well rather than five channels badly. If you have a presence on a channel simply because you feel you have to be there it often backfires. Here it is wise to evaluate the individual channels according their target groups and prioritize them. It may very well be the case that a newsletter is more important than a social media channel (for example to reach older voters). But if the intention is to reach first-time voters, it is actually smarter to be on Snapchat and Instagram. The important thing here is to campaign according to political objectives and individual policy areas. We currently have a very heterogeneous user community on the Internet, which means that not all topics must be equally divided among all channels. It is much more important to consider which users you want to convince with which policy and in a second step, consider which channel is the best way to reach these people. How important is the classical website in today’s politics? Does the social web play an even more significant role? Or do conservative means like billboards and TV spots still reach the most voters? The increasing importance of digital communications shouldn’t mean that other communication means are now redundant. The most important aspect here is a cross-media approach – that a party interlinks the individual channels effectively. If, for example, you have an attention-grabbing billboard that presents a new message, it’s a quick hit but you don’t have the opportunity to convey any further information or keep the voter’s attention for a long period of time. It is vital that parties build communications in layers, to present this message again on their website, present it in video format or link to a landing page to consequently guarantee attention in the long term. SEO is also a topic that is still widely underestimated in political communication. Booking the corresponding online search terms for a specific topic is recommended in addition to a billboard campaign. The same applies for airing TV spots. For the use of the second screen, it is just as important here to simultaneously present the well-prepared content and ensure its easy access. What can political parties learn from successful enterprise marketing and vice versa? There is currently a lot happening in the content marketing segment and companies are keen to increasingly sharpen focus on target groups. Particular attention is given to communication measures which convey the value of the product using a classical added value argumentation. Companies that have been communicating digitally during the past five or ten years can already look back on a collection of insights and will have determined, for example, that there is barely any interaction on Facebook when a particular topic is of no interest to the audience. Insights from digital marketing for companies must now also be collected and implemented in the political communication sector: This means that how to communicate content in an exciting manner and with the appropriate choice of words on social media and still supply added value must be understood. If you currently scroll through the Facebook pages of politicians, it is very one-sided: There is a strong focus on the person, but there is hardly any interaction with users. Let’s gaze into the crystal ball: How will political marketing develop over the next ten years? Political marketing will definitely become more data-driven, which means that it will be increasingly important for the parties to collect and evaluate data so that they can appropriately apply the information in (street) campaigning. That leads to improved segmentation and targeting. As is the case in the overall marketing segment, the tendency in the political space will be towards shifting the budget to the digital segment. That doesn’t mean that the offline channels should no longer be part of the plan, but the budget for the online segment will keep growing. Last but not least, I am convinced that there will be an increasing focus on storytelling. We are all bombarded with thousands of advertising messages daily and consequently, the growing challenge we face is how to stand out with our own message, how to move people and how to engage with them interactively. Storytelling, emotionalizing and creating a bond are consequently becoming increasingly important. What are your dos for political marketing 2017? What are your don’ts for political marketing 2017? Svenja Teichmann is Founder and CEO of crowdmedia GmbH – the digital consulting agency for content & online marketing. At crowdmedia she consults companies in the B2C and B2B segments with a focus on digital strategy, online marketing and social media & content marketing. Svenja is also active as a trainer, speaker and moderator. She trains management staff in Digital Transformation and Digital Leadership. 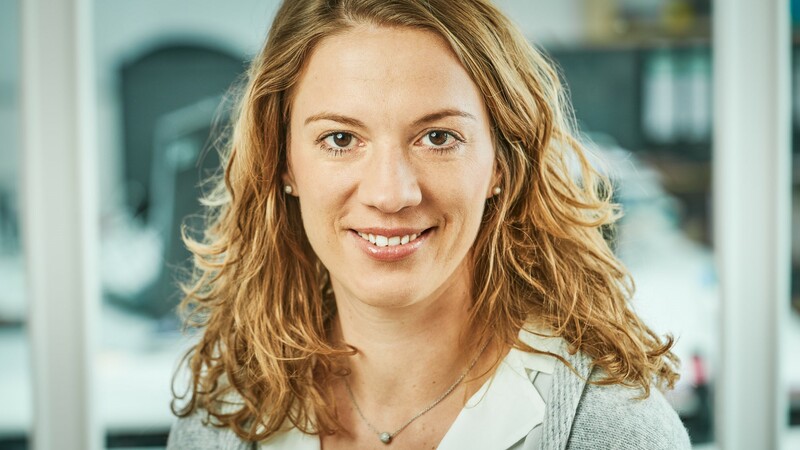 Svenja Teichmann provides cross-industry consulting for companies and organizations. For the last state election 2015 in Hamburg, she and her team were responsible for the digital campaign of the FDP Hamburg. In this year, the Young Liberals are counting on crowdmedia’s digital expertise. At the beginning of the year for the state election in North Rhine-Westphalia and currently for the federal election.